For decades, professional baseball players surnamed Weaver were routinely dubbed Buck by the sporting press. The game’s two most prominent Buck Weavers – the Black Sox third baseman and the late-19th-century outfielder also called Farmer Weaver – are already the subject of excellent BioProject portraits. The following is a biography of a lesser-known Buck Weaver, a journeyman catcher with four different early-Deadball Era ballclubs. This Buck Weaver was a light-hitting defensive standout whose most memorable feature during his major-league tenure was his tall, spindly physique, a characteristic that constantly stimulated the comedic impulses of era sportswriters.1 Among other things, the press labeled him Scissors, Stilt, the Human Hatpin, the thinnest catcher in captivity, and, most evocatively, Six O’Clock Weaver, so called because when his elongated frame straightened up from a catching crouch, he was said to remind observers of the hands of a timepiece stuck on the dinner hour. Less humorously, Weaver’s rail-thin build was likely a manifestation of the chronic health problems that shortened his playing career, and may even have prefigured his untimely death at age 37. When the Three-I campaign came to a close, Weaver moved up to late-season action against better competition, joining the Omaha Omahogs of the Class A Western League. The Rockford Republic predicted success: “Arthur Weaver, who caught splendidly for Cedar Rapids this season, will catch for Omaha the remainder of the season. ‘Buck’ ought to make good.”8 Appearing in a handful of contests, Weaver apparently made a favorable-enough impression to be placed on the Omaha reserve list.9 But he began the 1902 season back in Cedar Rapids. The solid work of his sophomore year (.278 BA/.972 FA) attracted notice, and by late August, Sporting Life was reporting that Weaver had been signed by a major-league club, the American League Cleveland Bronchos.10 But for reasons undiscovered, he never played in Cleveland. Rather, Weaver’s big-league debut came in the livery of the senior circuit’s St. Louis Cardinals. On September 14, 1902, Weaver and fellow call-up Jim Hackett formed the giant battery (both were 6-feet-2 or better)11 sent out in the fourth inning in relief of the O’Neill brothers (pitcher Mike and catcher Jack) to face the Pittsburgh Pirates. Although the newcomers bore little blame, the final results were not pretty, a 9-6 Pittsburgh victory marred by the commission of 13 errors, total. 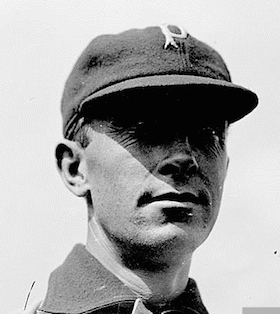 Weaver was charged with one of those miscues, but fared better at the plate, with a double in three trips against left-hander Warren McLaughlin. Strangely, given Weaver’s 14 years in Organized Baseball, it is uncertain which side of the plate that he batted from. No definitive statement on the subject was found during review of contemporary reportage, and modern baseball authorities like Baseball-Reference and Retrosheet list Weaver as: throws-right; bats-unknown. Certain newspaper descriptions of the extra-base hits of his minor-league days, however, suggest that Weaver was likely a righty batter.12 Whatever the case, Buck “never shone much as a hitter.”13 His underwhelming .182 (6-for-33) batting average in 11 late-season games for St. Louis was prophetic, the pacesetter for his lifetime .183 major-league average. Weaver made the Cardinals roster in 1903, but saw little game action. In 16 appearances he batted a respectable .245 (12-for-49), but without power (no extra-base hits and only five RBIs). Still, when released by St. Louis in early June, he was quickly snatched up by the league-leading Pirates as catching insurance for regular receiverEd Phelps and backup Harry Smith.14 Used sparingly behind the plate (11 games) and occasionally at first base (5 games), Weaver hit .229 (11-for-48) with a triple, the first extra-base blow of his big-league career, as the (91-49, .650) Pirates coasted to the National League pennant. Thereafter, he never stirred from the bench as Pittsburgh was upset by the AL Boston Pilgrims in the first modern World Series, five games to three. Buck Weaver would play professional baseball for another six seasons, but his major-league days were now behind him. During four big-league campaigns, he had appeared in only 86 games. A career .183 batting average with little power (only seven extra-base hits and 15 RBIs in 270 plate appearances) had made him little threat with the bat. But first-rate receiving skills and a rifle arm had afforded him a marginal career at the game’s highest echelon. An agreeable, upbeat personality – Weaver was well-liked by teammates, the local sports press, and club fans wherever he went – had also served him well. Those attributes would permit his professional playing days to continue. But around 1909, Buck’s health, never robust, began to fail him. In the seasons to come, severe asthma attacks would often put him on the sidelines. Although unreported during his lifetime, The Sporting News would later diagnose Weaver as suffering from tuberculosis.25 In either case, his baseball career had entered borrowed time. Weaver played well for Wichita (.280 BA), now graduated to the Western League. But periodic asthma attacks and the brutal Midwest summer heat limited his availability to little more than half the club’s games. After the season he was traded to Western League rival Denver, where, it was thought, playing in the Mile High City would be easier on Weaver.26 The Denver climate suited Buck, but road trips to less hospitable locales were another matter. In the midst of June away games, an asthma attack required that he be sent back to Denver, leaving the Grizzlies dangerously thin at catcher.27 As the road trip continued, an anxious Denver Daily News observed: “Should catcher [Hugh] McMurray get hurt Buck Weaver is ready to join the team at a moment’s notice, but it would be almost a crime to take him down to the low country.”28 Weaver was taken ill again during a subsequent road trip,29 and thereafter stopped accompanying the club out of town. He became a Denver home-games-only catcher. Notwithstanding that, Buck gave value (.256 BA and sterling defense) when in the pennant-winning Grizzlies lineup. He also became a great favorite of Denver fans and sportswriters. A return engagement in the Union Association of 1913 followed a now-familiar pattern. Weaver signed with a high-elevation club, the Great Falls (Montana) Electrics; performed well in the early going; fell ill once the club went on the road; and returned home to Denver to recuperate.39 He played intermittently thereafter but saw enough action (77 games) to be named the catcher on the Union Association All-Star team selected by the Salt Lake Telegram.40 When the Great Falls club disbanded over the winter, Salt Lake City and the newly formed Boise Irrigators vied for Weaver’s services, with the latter coming out on top. Buck also became a minor investor in the Boise franchise.41 He was batting .314 in 54 games when felled by his annual asthma attack.42 Soon thereafter, the Boise club folded. Salt Lake promptly claimed Weaver in the Boise player dispersal draft, but he declined to report. Instead, he went home to Denver, his 14-season professional playing career finally over. In February 1915, an admiring profile in the Denver Post revealed that Buck Weaver had “ended his diamond career … and is now a Denver businessman.” The Post added that the level-headed Weaver had saved his money “and is now on easy street financially, even though only 35 years old.”43 Before the year was out, however, Buck’s new position as superintendent of the Mountain Motor Oils Company plant in Denver would nearly cost him his life. On the morning of November 24, 1915, a massive explosion – probably caused by an electric spark that ignited oil fumes – reduced the plant to flaming rubble. Weaver and a teamster named Charles Peters were rescued from the debris by firefighters and rushed to a nearby hospital, but given little chance of survival.44 Within days, Peters succumbed to his injuries, but Weaver, despite suffering from serious burns, surprised his doctors by responding to treatment. In time he was discharged from the hospital. And after four-month convalescence, Weaver was able to return to work.45 But unbeknownst to him, he had less than a year to live. Sources for the biographical detail provided herein include the Art Weaver file maintained at the Giamatti Research Center, National Baseball Hall of Fame and Museum, Cooperstown, New York; Weaver family info and probate documents posted on Ancestry.com; and certain of the newspaper articles cited below. Unless otherwise noted, stats have been taken from Baseball-Reference. 2 The other Weaver children were William (born 1871), Emma (1874), Frank (1877), and Ethel (1886). 3 As per the Emporia (Kansas) Gazette, June 4, 1909. 4 As per the Evansville (Indiana) Courier and Press, June 10, 1906, reprinting an undated item from the Wheeling (West Virginia) Register. 5 Sporting Life, April 27, 1901, places catcher A.C. Weaver on the preseason roster of Cedar Rapids..
6 See the Rockford (Illinois) Morning Star, September 4, 1901. 7 Cedar Rapids (Iowa) Republican, date unknown, reprinted in the Rockford (Illinois) Republic, September 4, 1901. 8 Rockford Republic, September 1, 1901. The Republic’s use of Weaver’s first name, Arthur, is one of the rare instances in which he was referred to in newsprint as something other than Buck Weaver. 9 According to the Omaha World-Herald and Denver Post, September 24, 1901. 10 Sporting Life, August 30, 1902. See also Sporting Life, September 6, 1902. 11 Baseball-Reference and other modern authorities list Hackett as 6-feet-2 and Weaver as 6-feet-1. Contemporary reportage, however, suggests that both men were taller. 12 Note that the website baseballpage.com/players/weavear01 lists Art Weaver as “bats: left.” No source or authority for this designation is provided. 13 The Sporting News, March 29, 1917. 14 The St. Louis release and Pittsburgh acquisition of Weaver were noted in Sporting Life, June 13, 1903. 15 As per the Rockford Republic, February 23, 1904, Cincinnati Post, February 25, 1904, and Sporting Life, February 27, 1904. 16 As reported in the Cleveland Plain Dealer, March 6, 1904. See also the Evansville Courier and Post, March 6, 1904. 17 As reported in the Rockford Republic, May 2, 1904, and the minor leagues bulletin published in Sporting Life, May 20, 1904. 18 According to American Association final stats published in Sporting Life, November 5, 1904. Baseball-Reference provides no data for Weaver’s 1904 season. 19 In a news item reprinted in the Rockford Republic, January 31, 1905, the Cedar Rapids Republican identified St. Louis (not Philadelphia) as the American League club that drafted Weaver. 20 Wilkes-Barre (Pennsylvania) Times, March 24, 1905. 21 As reported in the Cleveland Plain Dealer, Rockford Register-Gazette, and Rockford Republic, July 3, 1905. The following winter, Detroit sportswriter Paul H. Bruske alleged that Weaver and pitcher Red Donahue were the only players against whom genial Browns manager Jimmy McAleer “ever cherished a genuine grudge.” See Sporting Life, February 17, 1906. If true, McAleer would be the only person known to have harbored dislike of the personable Weaver. 22 As per Sporting Life, September 7, 1907. It was later reported that White Sox veteran Frank Isbell had lobbied for the draft of his friend Weaver. See the Washington Evening Star, July 8, 1908. 23 As per Sporting Life, May 23, 1908. 24 As reported in Sporting Life, March 13 and 20, 1909. 25 See again The Sporting News, March 29, 1917. 26 The trade consisted of Wichita sending Weaver and outfielder Art Pennell to Denver in exchange for pitcher Pat Bohannon and outfielder Ira Belden, as reported in the (Little Rock) Arkansas Gazette and Denver Daily News, November 9, 1909, and Sporting Life, November 11, 1909. Little effort was made to disguise the fact that the trade was an accommodation to the well-liked Weaver, whom even opposing clubs wanted to see continue playing. 27 As reported in the Denver Daily News, June 16, 1910, and Denver Post, June 21, 1910. 28 Denver Daily News, June 28, 1910. 29 As reported by the Denver Daily News, July 19, 1910. 30 As reported in the Denver Daily News, October 3, 1910. 31 During the summer of 1911, Weaver caught games for the Denver Gunniston club, as per the Denver Daily News, August 11, 1911. He also played six games for the semipro champion Cheyenne Indians when they played in Denver. See the Denver Post, October 21, 1911. 32 As per the Denver Post, July 10, 1911. Buck had re-signed with Denver a week earlier, as reported in the Denver Daily News, July 3, 1911. 33 Salt Lake Telegram, March 23, 1912. 34 Sporting Life, August 10, 1912. 35 Weaver’s re-signing with Denver was noted in the Denver Post, September 9, 1912. 36 Denver Post, September 23, 1912. 37 To avoid the risk of another asthma attack, reported the Denver Daily News, September 25, 1912. 38 See the Denver Daily News, September 27, 1912, and Denver Post, October 6, 1912. 39 As recounted in the Salt Lake Telegram, May 15, 1913, and Denver Daily News, June 7, 1913. 40 See the Salt Lake Telegram, September 20, 1913. 41 As per the (Boise) Idaho Statesman, April 2, 1914. His one share of club stock cost Weaver about $500. 42 As reported in the Salt Lake Telegram, July 10, 1914. 43 Harry Rapp, “Living-It-Over-Again,” Denver Post, February 11, 1915. 44 For more detail on the incident, see the Denver Daily News and Denver Post, November 24, 1915. 45 As reported in the Denver Post, July 23, 1916. 46 As documented on the death certificate contained in the Art Weaver file at the Giamatti Research Center. 47 The Sporting News, March 29, 1917.